Primarily developed by Jules Stevenson, the project has been open sourced in acknowledgement of contributions of many other individuals to this project, and in the hope of drawing more talent to its ongoing development. Now that Bitbucket allows the hosting of downloads, we will publish any new compiled binaries here. For the foreseeable future, these will be Windows only (scroll down for information regarding Linux), and will be delivered in both .xsiaddon and clean folder structure formats. Older binaries may still be found on the SitoA Trac Wiki. The main delivery method for Kettle Shaders is .xsiaddon, which can be installed through Softimage's plugin manager. For those who prefer it, we also supply a file/folder structure identical to that which the .xsiaddon would deploy, which can be copied into [workgroup path]/Addons. Note that the Kettle Shaders have dropped SPDL support in favor of Python-based ShaderDefs, meaning that they are exposed to Softimage version 2011 and beyond only. 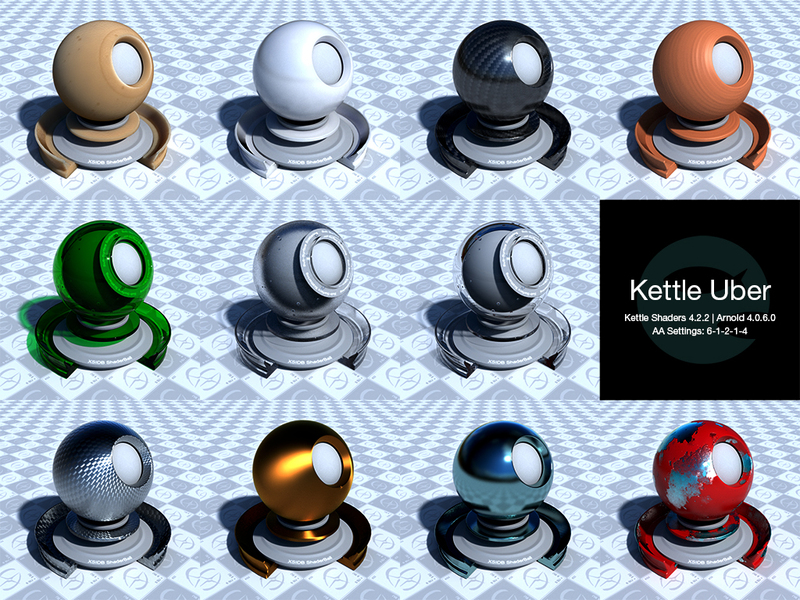 Kettle is currently a Windows-only studio, with the combined Linux-related knowledge of a tub of margerine. We recognise that many studios use Linux, and as such warmly welcome any related code and wiki contributions to the repository. However, due to our limited knowledge we are unable to offer support on these contributions or provide Linux troubleshooting. We suggest that any related Linux elements in this repo be treated as untested/potentially out-of-date just to be on the safe side, because we sure won't have updated it to stay in line with the rest. Thanks to Alan King, Alan Jones, Pal & Szabolcs, Thomas Helzle, Rob Wuijster, Simon van de Lagemaat and all the Solid Angle lovelies and many others for their contributions. Copyright (c) 2013, Kettle Studio Ltd. All rights reserved. THIS SOFTWARE IS PROVIDED BY THE COPYRIGHT HOLDERS AND CONTRIBUTORS "AS IS" AND ANY EXPRESS OR IMPLIED WARRANTIES, INCLUDING, BUT NOT LIMITED TO, THE IMPLIED WARRANTIES OF MERCHANTABILITY AND FITNESS FOR A PARTICULAR PURPOSE ARE DISCLAIMED. IN NO EVENT SHALL THE AUTHORS BE LIABLE FOR ANY DIRECT, INDIRECT, INCIDENTAL, SPECIAL, EXEMPLARY, OR CONSEQUENTIAL DAMAGES (INCLUDING, BUT NOT LIMITED TO, PROCUREMENT OF SUBSTITUTE GOODS OR SERVICES; LOSS OF USE, DATA, OR PROFITS; OR BUSINESS INTERRUPTION) HOWEVER CAUSED AND ON ANY THEORY OF LIABILITY, WHETHER IN CONTRACT, STRICT LIABILITY, OR TORT (INCLUDING NEGLIGENCE OR OTHERWISE) ARISING IN ANY WAY OUT OF THE USE OF THIS SOFTWARE, EVEN IF ADVISED OF THE POSSIBILITY OF SUCH DAMAGE.